Even if we do not try to be, we can all be biased and partial to others. Some people connect with us right away while others we will struggle to make a connection. When it comes to holding a bias-free interview, there are some things you can do that will help you stay impartial to the candidates. It is easy to get sidetracked in conversation with someone that you connect with. Create a standard question list that you ask all interviewees and compare their answers. If you get off topic with them too much, it can cause you to lean one way or another based off of personal connection rather than other criteria. Prior to the interview stage, create a rubric of skills that you are looking for in a candidate. List specific skills, both soft and education based. You will want to add cultural fit to your criteria. Just because an individual has the right skill set does not mean they will fit in with the company. After you are through with the interview, rate the candidate on each section of the rubric. 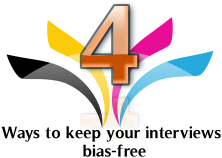 This will help you stay impartial to other interviewees. It is important that you take good notes during the interview so that you are able to gather the information you need. Jot down the notes as soon as you dismiss them from the meeting. Doing this while things are still fresh in your mind is vital to keeping facts straight. This is especially important if you have interviews back to back for a position. What you learn about the person will be harder to recall if you see several people in the same day. Run the candidates and data by other people in the company that you trust. Inviting a third party to look at the information will bring perspective to the situation. This person is not personally connected in any way with the interviewee and makes it harder for them to be bias. When they ask you specific questions of why you want to hire one person over another, it will help you to justify your answers. If you are unable to come up with sufficient answers as to why you want one candidate over another, it will help you to determine if you are making a bias choice. Let us help you find the right talent in your next hiring process. We would love to hear your comments. Please contact Otis & Tina Bishop!